Down syndrome advocates launch “Don’t screen us out” campaign urging UK Government to halt new screening proposal. The number of babies with Down Syndrome aborted is set to to increase following a decision released this morning. UK Down’s syndrome advocates have today launched the new campaign, Don’t Screen Us Out, after the UK National Screening Council (UKNSC) released its decision to recommend the implementation of a non-invasive prenatal testing (NIPT) technique called ‘cell-free DNA’ (cfDNA), which may lead to a profound reduction in the number of children born with Down’s syndrome. “While the screening itself is being heralded as a move to reduce the number of miscarriages associated with invasive amniocentesis, the UKNSC have glossed over the fact that their pilot study predicts cfDNA screening will detect 102 more babies with Down’s syndrome every year. Latest figures tell us that 90% of babies who are prenatally diagnosed with Down’s syndrome are aborted. If we are to apply this percentage to these newly detected babies, this would mean an increase of 92 abortions for babies with Down’s syndrome annually and an overall decline of reported Down’s syndrome live births by 13%. Such an outcome is likely to have a profoundly negative impact on the Down’s syndrome community”. 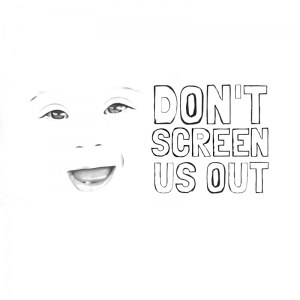 The Don’t Screen Us Out campaign calls on the government to halt the implementation of cfDNA screening and to introduce reforms which would support those with Down’s syndrome and their families. The release of the decision coincides with the recent release of a UN report from the International Bioethics Committee (IBC) of the United Nations Educational, Social, and Cultural Organisation (UNESCO) issuing a stern warning about the drive to adopt NIPT in national screening programmes, “the potential ethical disadvantages of NIPT can be summarised as routinisation and institutionalisation of the choice of not giving birth to an ill or disabled child”. The Governmental enabling of such an approach, also violates the UK’s treaty obligations to the UN Convention on the Rights of Persons with Disabilities (CRPD) to make sure that its health policies – including antenatal screening – are informed by and reflective of a ‘social model’ understanding of disability. As indeed does the haphazard medical support for parents whose child is diagnosed with fetal disability, which leads to pressure on parents to abort their babies with disabilities such as trisomy 21 and causes the conditions that drive the low proportion of Down’s syndrome births. This constitutes a failure to implement section 23, subsection 3 of the CRPD for early and comprehensive support to families with children who have Down syndrome. “Greater support is necessary for parents who are expecting a child with Down’s syndrome. For example, there is a lack of clarity in communicating the diagnosis or prognosis of fetal disability, and the presumption from many medical professionals that parents would opt for abortion. This is worsened by the fact that there is also limited information and support for the option of raising a baby with Down’s syndrome”. The cfDNA test should not be implemented into the UK Fetal Anomaly Screening Programme at this stage. Given the state of the medical system as it currently exists, cfDNA may only worsen the culture of informally eugenic anti-disabled discrimination that exists in our screening programme health services. Don’t Screen Us Out are urging members of the public to visit www.dontscreenusout.org and to use the site to contact their MP urging them to write to the Secretary of State for Health, Jeremy Hunt, asking that the government halts the introduction of second-line cfDNA screening. Lynn Murray, Spokeswoman, Phone: (0044) 1313340133, Email: savingdowns@gmail.com. 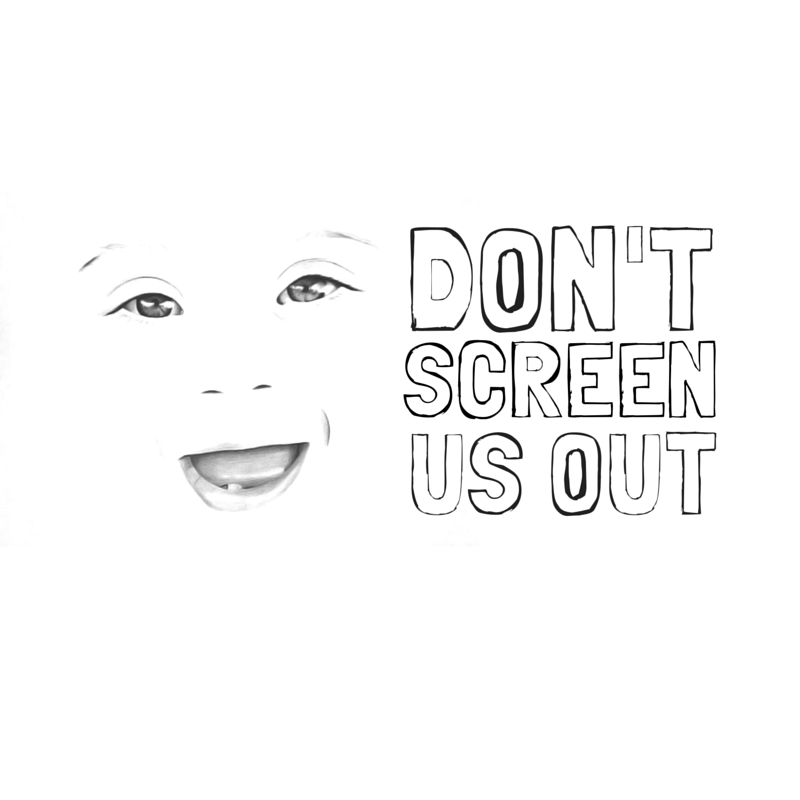 For more information on Don’t Screen Us Out campaign, see our website www.dontscreenusout.org. On Friday 15 January the National Screening Committee released a recommendation that second-line cfDNA screening (NIPT – non-invasive prenatal testing) be implemented into the NHS Fetal Anomaly Screening Programme (FASP). The proposal has been presented as a measure to reduce number of miscarriages from invasive testing. What has not been highlighted is that the National Institute for Health and Research RAPID evaluation study projects that the proposed implementation will result in 102 more Down Syndrome foetuses being identified each year and based on the current 90% of parents with a diagnosis that terminate a pregnancy, this will result in 92 more Down Syndrome foetuses being aborted each year. Given there were 717 Down Syndrome live births in 2013, this would represent a 13% decrease in live births for Down Syndrome – therefore likely having a profound effect on future numbers of people with Down Syndrome in the population. Advocacy groups for people with Down Syndrome have voiced their concerns about the proposal (http://www.theguardian.com/society/2015/oct/17/living-with-downs-syndrome-hes-not-list-characteristics?CMP=share_btn_fb). The consultation has failed to meet UK’s obligations under United Nations Convention on the Rights of Persons with Disabilities (CRPD) – see press release above and submission. Coincides with report from International Bioethics Committee ​(IBC​) of the United Nations Educational, Social, and Cultural Organisation (UNESCO​) issuing stern warning about the adoption of NIPT in national screening programmes (http://unesdoc.unesco.org/images/0023/002332/233258e.pdf). In addition to concerns around disability, IBC also list concerns around gender-selective abortion – as NIPT can be used to detect the gender of a fetus. Private availability of cfDNA testing has already been blamed for a 34% increase in numbers of foetuses aborted with DS and other disabilities in three years. NIPT techniques will shortly allow for the testing of the entire human genome, and the targeting of fetuses for abortion based on a range of illicitly considered characteristics. The future market for testing could exceed $6 billion in the US alone.